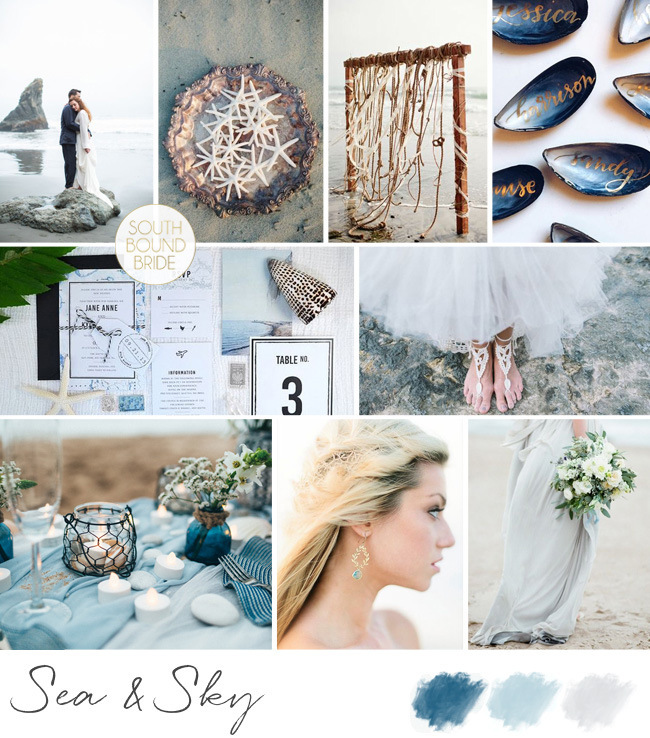 It’s been such fun highlighting beach weddings these last weeks, and looking back through the archives, I was reminded how many fun beach inspiration boards I’ve created over the years. 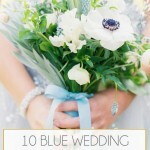 And while, yes, many are a play on various shades of blue (because come on, SO lovely! ), there are also less traditional combinations, with brights and neutrals and sparkle and texture all playing their part. So I’ve rounded up (and in some cases, spruced up!) ten of my all-time faves. 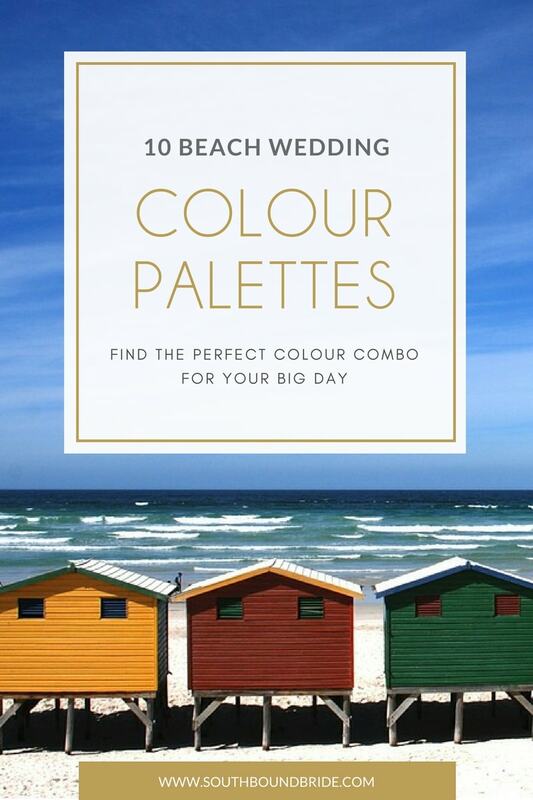 Click on to discover your new favourite palette for a beach wedding! *Links in bold denote affiliate links. SouthBound Bride may make a commission if a sale is made. This one only made its debut a couple of weeks ago, but I happen to think it’s rather lovely. The colours are reminiscent of a beach sunset, which is a different take on a natural ocean palette. 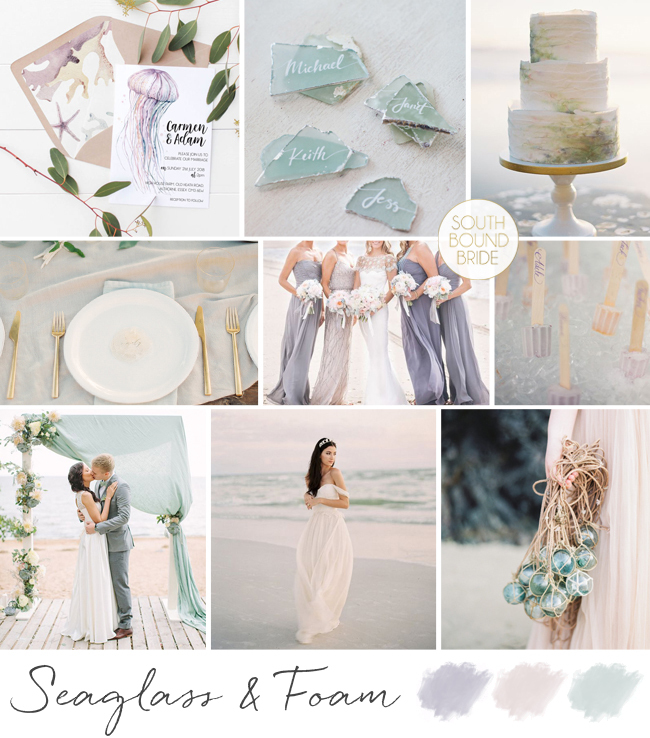 And while it’s made up of peach, mint and lavender, there’s nothing to girly about these pastels when balanced out with some natural texturing, especially glass. There’s something so beachy about coral, beyond the obvious – this colour really comes into its own for me when put into a coastal context and allowed to shine next to soft neutrals. 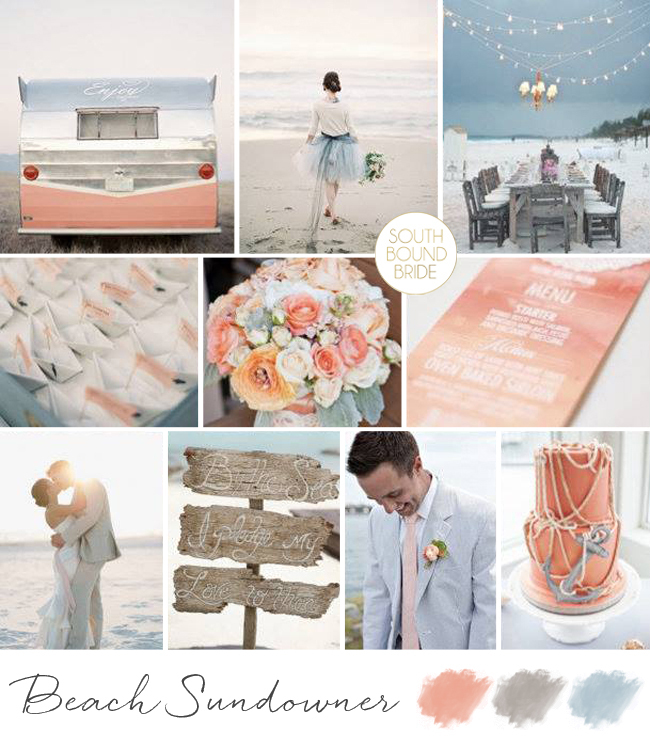 Here warm coral is mixed with classic grey and then given an update with a shot of pale dusty blue. Gorgeous. If I remember correctly, this is one of our all-time most popular boards. I think of it as, if a mermaid got married, this is what it might look like. 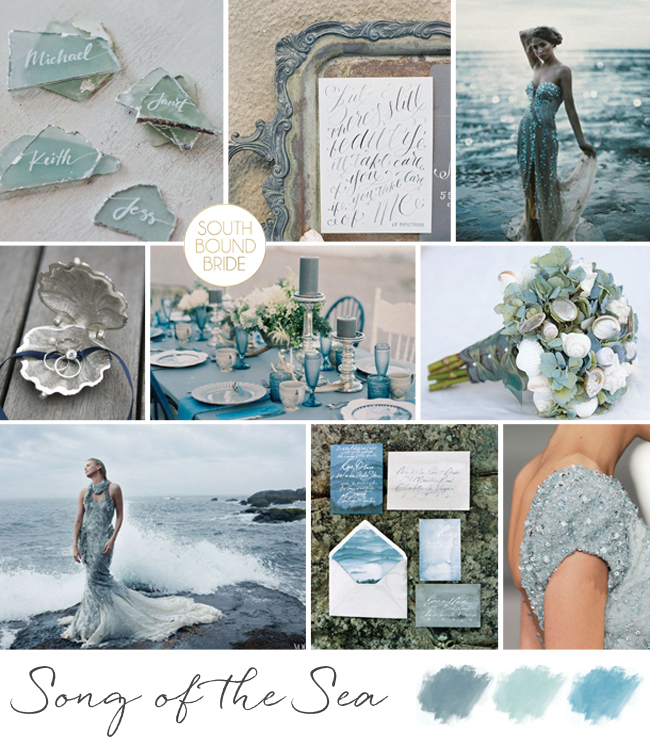 A classic beach palette, reflective of a stormy sea, with a touch of sparkle and a hint of magic. I think calligraphy works particularly well here, to reflect the sweeping, romantic look. I kind of want to step inside this board and live in it – this preppy take on beach style is right up my street! Yes, it’s another variation on the mixed blue palette, but this time, white and beige play a much bigger role, and the end result is clean, classic and just the right amount of laid back. 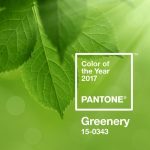 Last year’s Pantone colours of the year make for the prettiest of beach palettes – soft pink and blue, like a coastal dawn or that hour just before sunset. 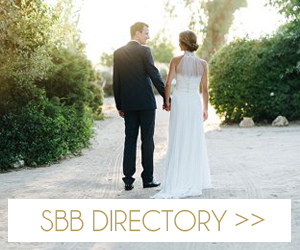 Mix soft, romantic fabrics and whimsical details – white coral cake toppers, glass ‘message in a bottle’s, a draped ceremony arch, and of course, a cathedral length veil! 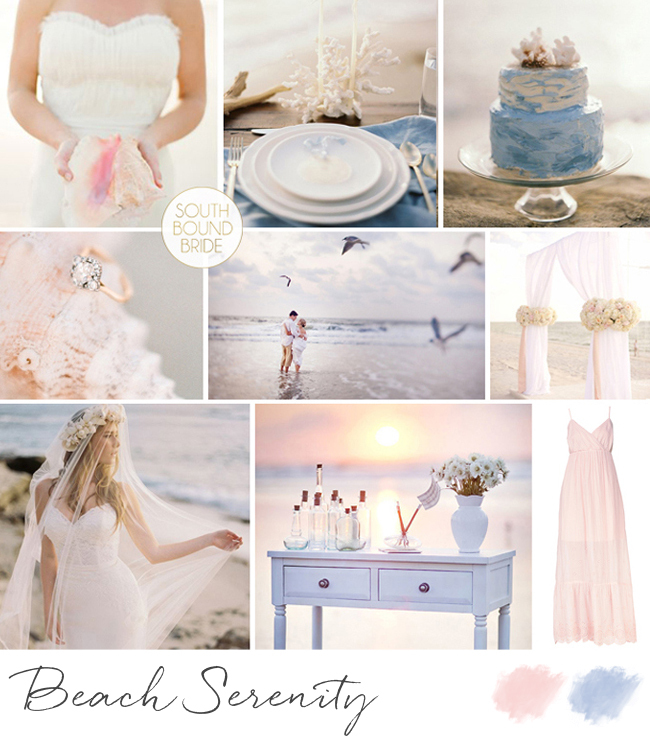 Let’s move away from those pastels for a second, because beach weddings are also about brights! Pops of bougainvillea pink make for the absolute perfect highlight – this summer flower is the perfect tropical bloom to have as an accent (love it used as a cake topper here!). 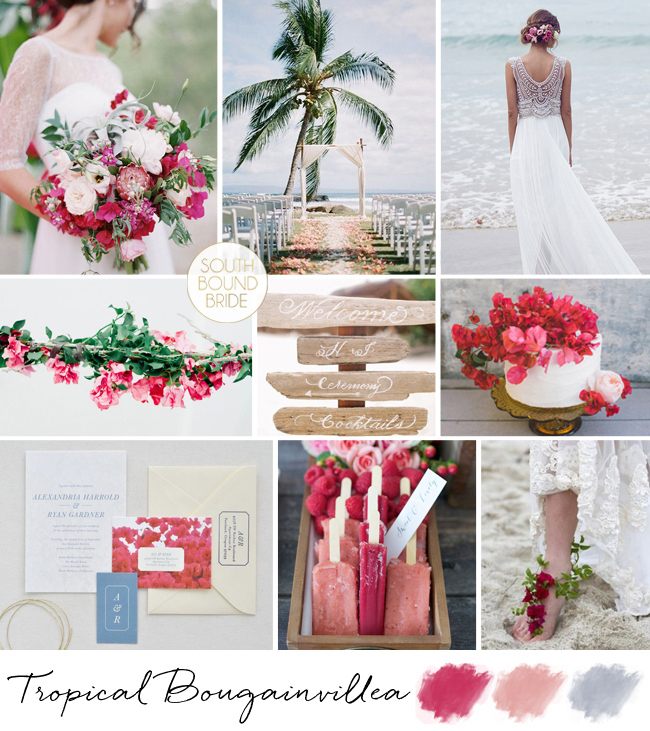 Serve popsicles (alcoholic or not), plan a ceremony with a view, and change up barefoot boho for a little bit of floral adornment for your toes. So lovely! When a colour scheme is inspired by a cocktail, you know it’s going to be awesome, right? This little board was named for rum punch, and its bright, beautiful citrus colours speak of fun and laid back, beachy celebration. Add in hibiscus accents (that bouquet though!) 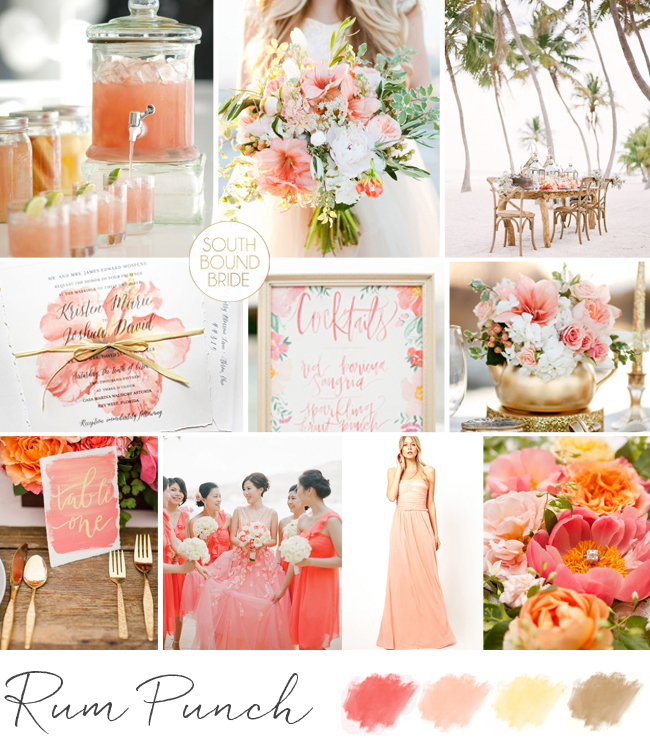 and bright coral bridesmaid dresses, and I’m in colour heaven. 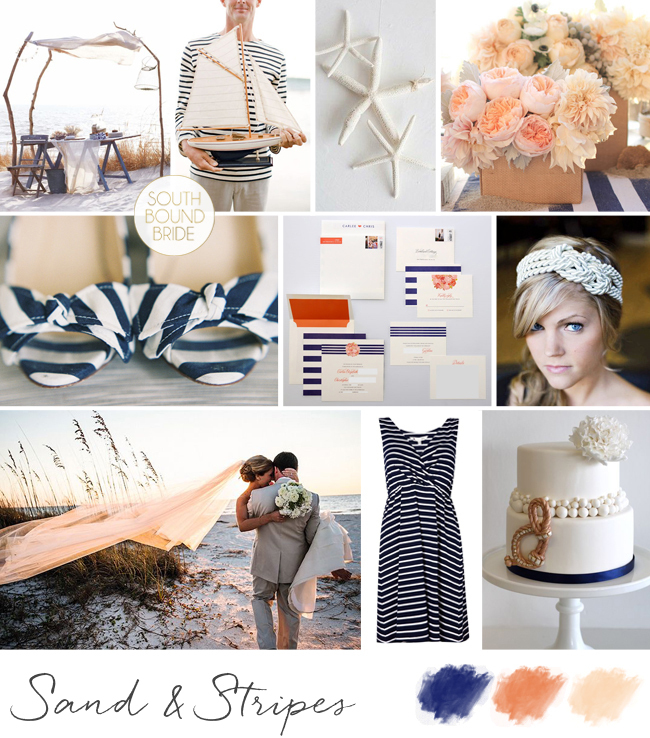 This is an older board which I’ve given a little revamp because I love the mix of the standard nautical navy and white with coral and peach mixed in. 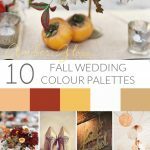 This is a perfect palette to me if you’re looking for something rustic but also elegant. You can go for chunky natural textures and nautical elements, but then add in Breton stripes for that classic seafarer look. And a nautical knot hairpiece? Perfection. 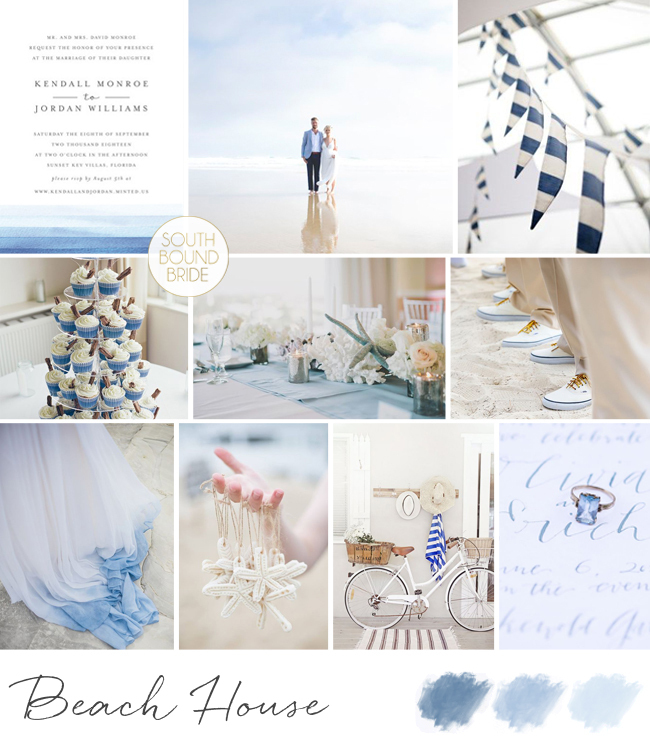 Finally, there’s another revamp from the archives, because nobody said that beach weddings couldn’t be GLAM! 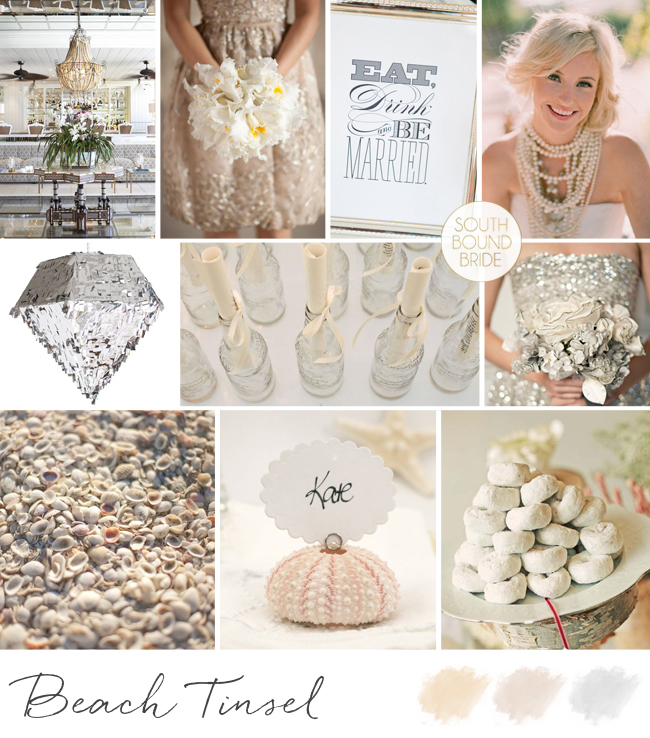 I love the idea of soft mixed metallics for a beach wedding, it’s like a glamorous take on the mixed neutrals of shells and sand. Bling it up, and add awesome touches like a sparkly pinata, a donut cake, and a bold grouping of pearl necklaces. Everything about this screams fun! These are perfection! Thanks for the inspiration. Pinning now! © Copyright 2017. SouthBound Bride. All Rights Reserved. Design by Bloom.